Westminster, London Complete 1,500 sq.m. 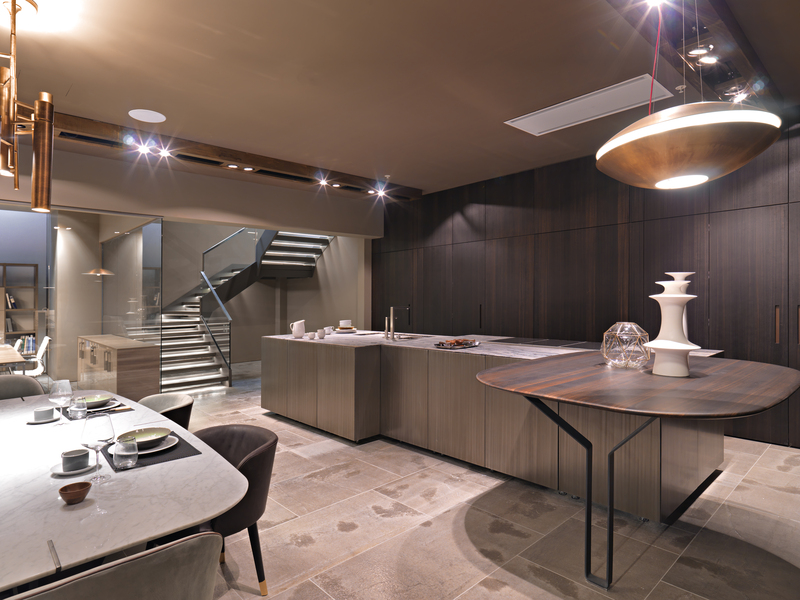 Working with Italian kitchen brand Rossana, we have completed a flagship kitchen showroom in Wigmore Street, the heart of London’s kitchen Mecca. 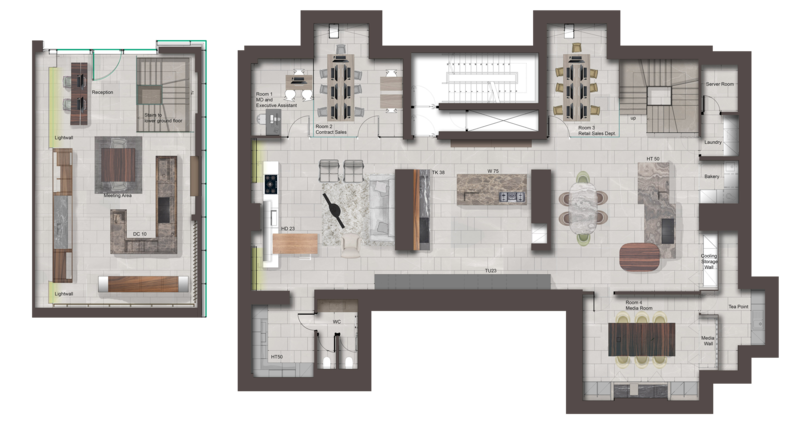 We were appointed as architects and interior designers to complete the detailed design, construction and fit-out works to transform the 2-storey shell into the perfect environment for the beautifully-crafted designer kitchens. This was building on an initial concept design produced by leading Rome-based designer Massimo Castagna. The unique setting creates the appropraite ambience that is at once minimal and dramatic. Incorporating a limited pallet of natural finishes to floors, walls and ceilings which have been selected to both enhance and complement the new kitchen displays, the main spaces are unified throughout by the use of flamed antique Farsena stone providing a monolithic floor finish that runs from the main ground floor entrance onto the bespoke open riser staircase and down to the lower ground floor level, visually connecting each of the two main zones. 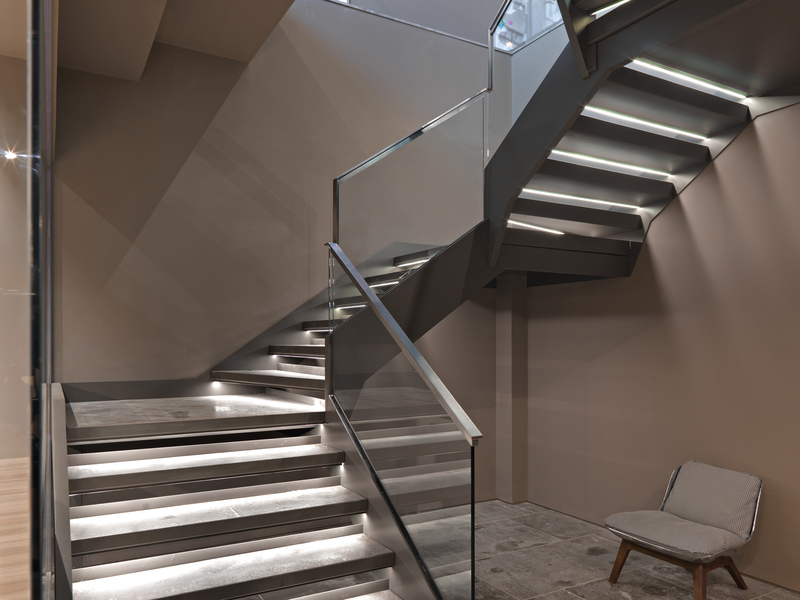 The Farsena stone finish is laid over a new raised access floor that conceals mechanical and electrical services that can be easily accessed if the showroom layout is altered in the future. Farsena stone is also used as a feature wall panel at ground floor, with the stone pattern flowing naturally from floor to wall. A lighting scheme that provides both ambient background lighting using floor to ceiling illuminated wall panels with integrated LED fittings, and also feature lighting to highlight and enhance individual kitchen display areas with beautifully crafted pendant fittings and adjustable ceiling mounted spotlights set in continuous linear burnished brass ‘light bars’ provides a variety of theatrical illumination to highlight individual displays with easy on the eye restful background illumination gently washing the main spaces. 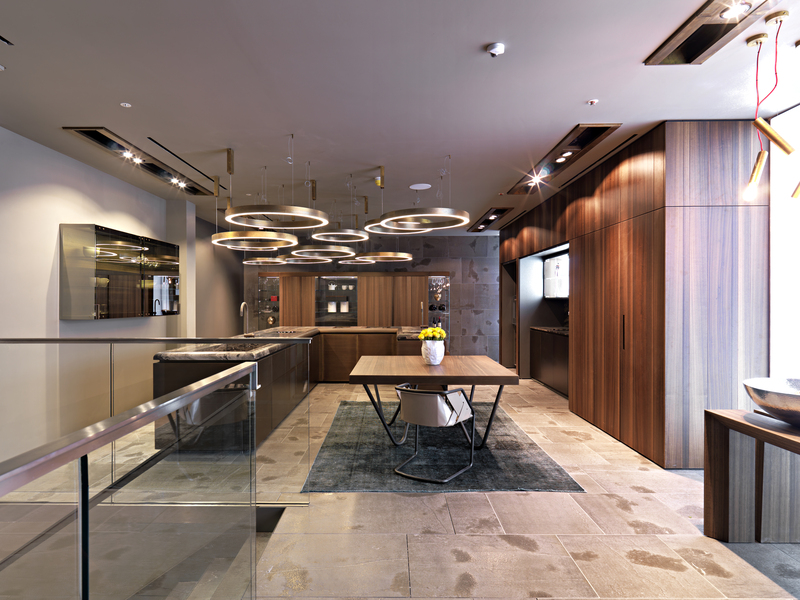 All lighting is fully controllable using DALI wiring to enable individual lighting levels to be set for all fittings within the showroom. 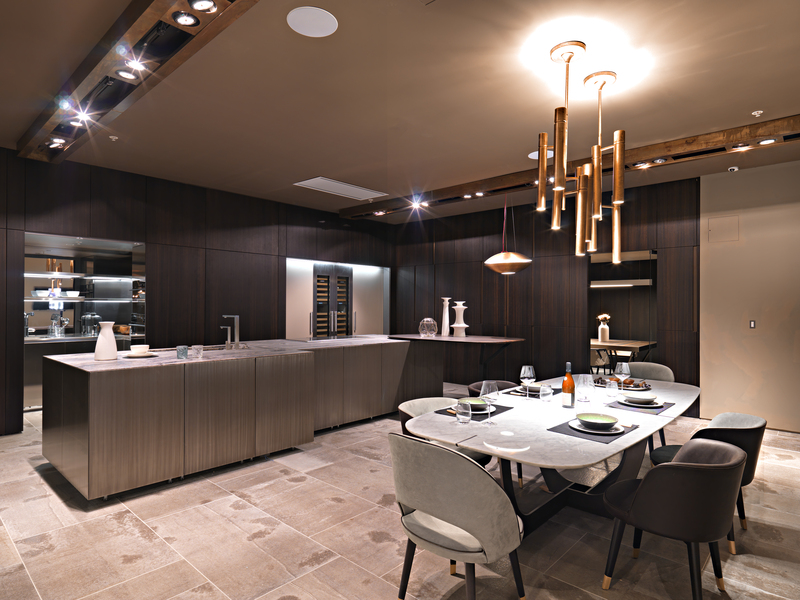 The show kitchens evoke the highest quality in design, materials and workmanship combining burnished brass and pewter metallic finishes, lacquered and veneered cabinetry, and with tantalising countertops in marble and stone, all with immaculate detailing and finish. 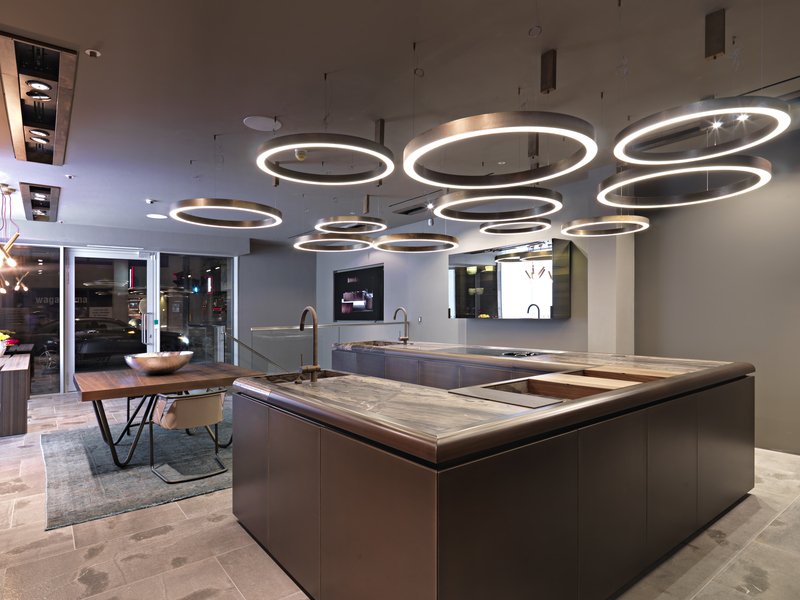 At ground floor, the flagship DC10 collection is set in a U shaped island with 11 feature burnished brass LED light rings hovering above the display unit. At lower ground floor, the HT50 collection is the main focus, flanked on two sides by wall to wall ‘Architectural’ panelling finished in Eucalyptus veneer, part of the design range that incorporates full height panels concealing pocket doors that open to reveal a bespoke Utility Room, Bakery, and a bank of wine coolers with appliances supplied by Sub Zero / Wolf. Within the washroom area Farsena stone is used as a finish on floor and walls and on the full width vanity basin and countertop. A sense of opulence is provided in this area with the incorporation of LED ambient background lighting that washes across the stone and illuminates the large inset mirror over the basin area. Sensor operated wall mounted WC’s in each cubicle, and a sensor activated wall mounted spout hovering over the integrated stone washbasin further enhance the luxury of this area.